In today’s high tech manufacturing environment there are times that you need to keep your product and sub assemblies protected from air born contaminants and dust. Short of manufacturing in a clean room, there are other measures you can take to control the work environment. Standard clothe material may add some protection but at the same time could actually create static charges that can harm electronic devices and increase the attraction of dust and debris. 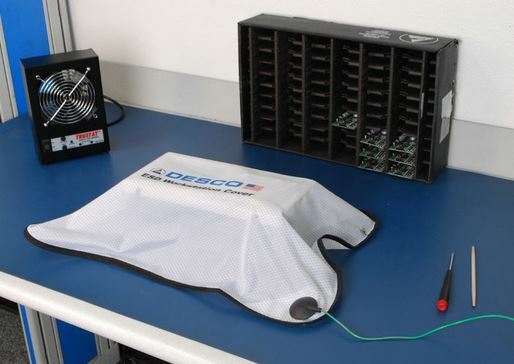 The solution….Desco ESD Work Station Cover. Desco’s ESD Workstation Covers are made from a texturized polyester and a minimum of 9% carbon mono-filament with bound edges. They provide continuous and consistent charge dissipation throughout the lifetime of the cover. The ESD Workstation Covers are designed to protect products on the workstation from ESD, dust and other contaminants. A 10mm (3/8 inch) grounding snap allows the cover to be grounded to the workstation’s common point ground. The ESD protective symbol, Desco logo, Flag and “ESD Workstation Cover” are imprinted in the center.